You may still be able to book by calling the hotel at 44-1684-296200. A picturesque resort in Tewkesbury, the Hilton Puckrup Hall is an unexpected getaway you won't soon forget. An 18-hole golf course, a spa and an indoor pool are just some of the activities you can enjoy, so whether you're traveling with friends, as a couple or with kids, there's something for everyone to revel in. Rooms are spacious and bright, with plasma TVs, comfortable beds and coffee makers. As if the hotel doesn't provide enough to do, the surrounding area provides plenty to do and see as well. But, you'll probably be enjoying your retreat at the Hilton Puckrup Hall too much to even notice. 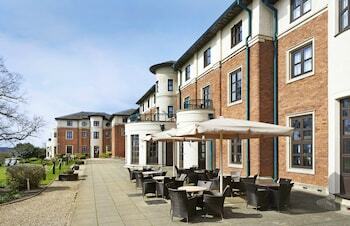 Hilton Puckrup Hall Tewkesbury is a 4-star hotel located at Puckrup, Twyning, Tewkesbury, GL20 6EL, GB . Its nightly price usually falls between $72.72 per night and $1278.45 per night, excluding tax, depending on room category. $73 per night found for a Twin Hilton Guest Room - Non-refundable room type. Hilton Puckrup Hall Tewkesbury sells rooms through sites like Room 77, Expedia, Hotels.com, GetARoom, and many others. Room 77 searches across dozens of different sites to find the lowest discount rates available. The lowest rate we've seen over the last few weeks was found on Room 77. In 1% of the cases we surveyed, all sites offered the same rate. You can compare real-time rates from all of these sites on Room 77. Room 77 is the only hotel shopping site that includes special discounts like AAA, senior, government, military, and corporate rates.